A NEW RUGBY season is just around the corner. We can tell because the RaboDirect Pro12 have today released its fixture list for the new season. Exact kick-off dates and times are yet to be finalised, but the league has penciled in the 2013/14 season fixtures into weekend windows. The opening round of fixtures will see Munster and Connacht stay at home with the southern province’s Heineken Cup opponents, Edinburgh travelling south and Zebre heading for The Sportsground. 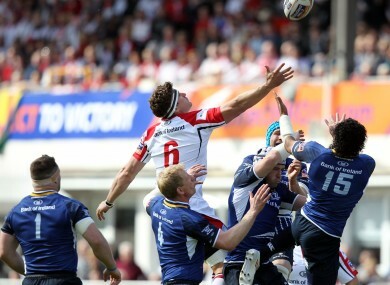 Ulster and Leinster will both travel to Wales on the opening weekend, to face the Dragons and Scarlets respectively. Ulster’s first competitive outing at the new Ravenhill will be against last season’s semi-finalists Glasgow Warriors a week later. The first inter-provincial clash of the new season will take in place in Galway on the weekend of September 20 when Mark Anscombe’s Ulster renew acquaintances with Pat Lam’s Connacht. Two weeks later, the second inter-pro will be hosted by Munster, with new Leinster coach Matt O’Connor facing a trip to Limerick a week before the opening round of the Heineken Cup. Connacht will bookend the break for European action with a trip to the RDS in the sixth round of fixtures on October 25. The traditional Christmas inter-pros will see Ulster visit Dublin and Munster host Connacht with with the western and northern provinces returning home to face Leinster and Munster in first action of 2014. You can view the full PDF list of RaboDirect Pro12 fixtures here. Email “Take your seats: The RaboDirect Pro12 fixtures are out now”. Feedback on “Take your seats: The RaboDirect Pro12 fixtures are out now”.